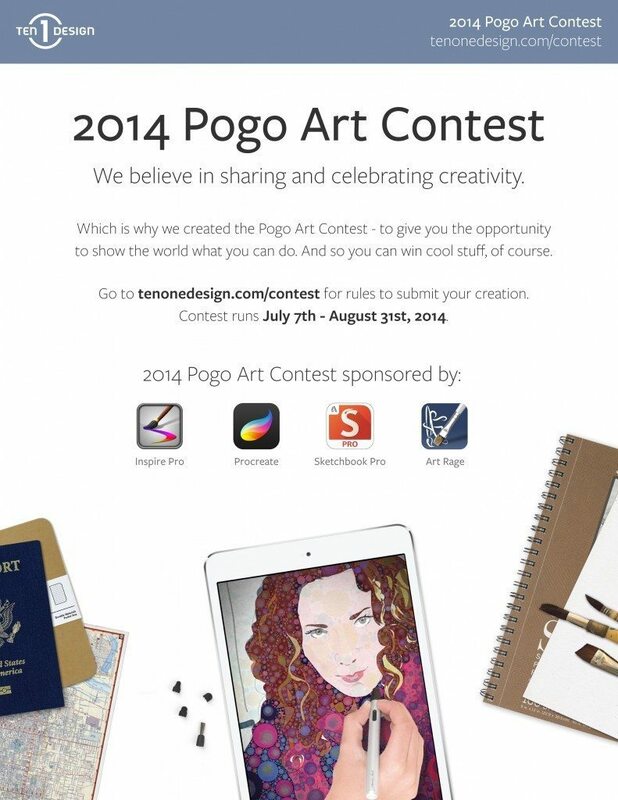 The Pogo Art Contest is an annual contest for mobile artists using the Pogo stylus on iOS devices. Run by TenOne Design, the people behind the Pogo stylus, this year’s contest was sponsored by ArtRage, along with Inspire Pro, Procreate and Sketchbook Pro. There will be an overall grand prize winner, and three secondary winners in each category. The contest opens July 7th. You can follow contest updates on Twitter under the hashtag #pogocontest. For anyone who is posting satirical or thoughtful explorations into world events, politicians, news of the day, journalistic. This is for out-of-the box thinking, such as using an app not necessary or intended for making art. Or using a variety of apps (app mashing) in a very creative way. Something that no one has done before. Also could include collaborative efforts with more than one artist. Representational, realistic/impressionistic art goes here; this includes landscapes, still lifes and portraits of people, aliens and pets. The TenOne Pogo Creative Stylus is compatible with our ArtRage for iPad app.